If you’re looking for a high power quality generator for your home, business or recreational use, the DuroMax XP12000EH deserves some serious attention. It provides 12,000 watts of peak power and 9 500 watts of constant power output. This means that it can supply just about any regular household with all the electrical power you’ll need. The peak power capability means that it can provide enough current for high power capacitor start-up appliances like fridges or any machinery that uses an inductive current motor. They are a California-based company and unlike most of their competitors, they manufacture their own engines. As a local US manufacturer, they comply with ETL and MTL standards. They also ship replacement parts to anywhere in the world. To give their customers complete peace of mind, they offer an extended warranty option, which goes beyond the normal one year period – with extensions for two to three years. Dual fuel technology allows generator to be run on propane or gas. Dual Fuel Generator : Propane or Gas. Heavy duty frame has four point fully isolated motor mounts. Low vibration. Quiet. Full Control panel with oil warning light, volt meter, circuit breaker and power outlets. Low oil shut-off protects engine. Quiet Muffler reduces engine noise. Cannot ship to California – Non-CARB unit. Spark Arrestor. EPA approved. Can be safely used in US national parks. 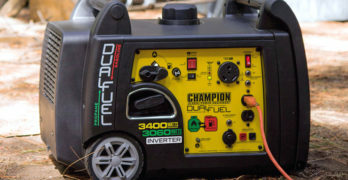 DuroMax XP12000EH Dual Fuel Electric Start Generator. Let’s take a look at what makes the DuroMax XP12000EH a serious contender to be rated as one of the best gas powered portable generators available. The DuroMax XP12000EH can run on either regular gas or propane gas. The versatility of dual-fuel capabilities has several advantages and we’ll be looking at that in more detail later in the article. So keep reading. To deliver enough reliable current to keep your home powered up in an emergency or keep machinery running on a construction site, you’re going to need a dependable, powerful engine. It uses an 18 horse power 457 CC engine, with an Over Head Valve (OHV). The cylinder sleeves are cast iron and bearings are made from steel. The locally built engine is both powerful and reliable, giving you trusted reliability when you need it most. A portable gas generator has to be built solidly to handle tough conditions in any working environment. The DuroMax XP12000EH is built from the highest quality materials and to the most stringent quality control standards. The engine is mounted using four-point rubber mountings, this ensures smooth running and durability, even under the toughest working conditions. Heavy duty frame with four Point fully isolated motor mounts. When it comes to your safety there can be no compromise and the DuroMax XP12000EH is equipped with every conceivable safety feature one could want from a gas powered generator. Let’s take a look at what safety features it provides. The DuroMax XP12000EH has a main overload circuit breaker and individual circuit breakers for each of the power outlet sockets. This prevents any damage caused by circuit overload or short circuit. The circuits breakers can be reset when the power overload has been corrected. When the oil level runs low a warning light will come on and the engine will switch off. This prevents overheating and any damage that may be caused by running the engine with too little oil. The muffler is designed to prevent sparks that can pose a fire hazard. The spark arresting muffler meets the requirements set by the US Forrest Services and complies with the regulations of most states for use in places where there is a fire risk. The DuroMax XP12000EH comes complete with a transportation kit which includes large rubber wheels and handles for great portability. Note: The DuroMax XP12000EH and the DuroMax XP10000EH are identical except for the amount of power they generate so we recommend watching the video above to learn more about DuroMax Dual-Fuel generators. So many people who have used a portable generator with a recoil (pull) starter will know how tedious this can be. The good news is that the DuroMax XP12000EH is equipped with an electric starter, so it will start with the turn of a key. To make things better, it also comes with a recoil starter, so you can still start it if the battery runs low – giving you the best of both worlds. The user panel gives you great functionality without over complicating things with switches and gauges that you don’t need or understand. It has two regular 120V plug outlets like you’d find in your home and a 30A 120V twist-lock outlet which is very handy for RV owners. There is also a high current 120V/240V outlet, this can be connected via a transfer switch to your main power distribution board. It has a volt meter, so you can keep an eye on the voltage and ensure that your appliances are not running the risk of damage from over or under voltage. There’s also a handy 12V outlet for charging batteries. One could never expect a generator capable of delivering such a large amount of power to be completely silent. However, the brilliantly designed muffler on the DuroMax XP12000EH means that the noise level is surprisingly low for a machine of this caliber. Gas only 12,000 Watt generator. Essentially they are the same basic generator with the same engine and current output. They look the same and perform the same function. There is one fundamental difference, the DuroMax XP12000EH has a hybrid due-fuel engine. While this makes it more expensive than the DuroMax XP12000E, it does come with the advantage of being able to use propane gas. So if you’re wondering why should you pay more for this single difference, now is the time to look at the advantages of using propane gas. Propane gas is stored in a compressed state, meaning that a single cylinder the size one would normally for a gas barbeque, can run the DuroMax XP12000EH for 20 hours at 50% average current load. By comparison, the 8 gallon gas tank fitted to the generator will give you 10 hours for the same power usage. Propane gas is stored in a totally sealed container, this means there can be no spillage when being transported or stored. There is also no fumes emitted from the container that can ignite. Because the container emits no fumes, there is no unpleasant odor that is usually associated with gas storage containers. Runs on gasoline or liquid propane. Highly versatile during emergencies. 18 HP engine can accept high-wattage loads with ease. 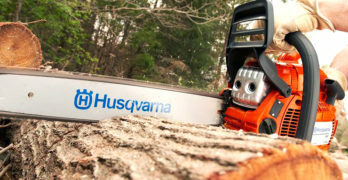 Practical Uses : Home standby power, job sites, RV camping…and more. Maximum power from each of the 120-Volt receptacles and to choose between operating at both 120-Volt and 240-Volt simultaneously or at 120 only with full power. Equipped with low oil protection, AC and DC regulators and a spark arrestor, ensuring your unit will remain safe and in top operating condition. Easy to start and operate with electric and recoil start. 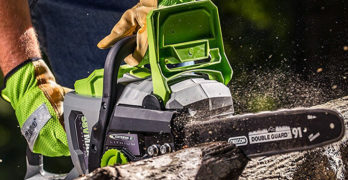 Is the DuroMax XP12000EH Right for You? The DuroMax XP12000EH is named The Beast for good reason, it’s an extremely powerful portable gas generator – capable of running your entire house during a power outage. Its durability is unsurpassed, meaning that it will give you years of reliable service. The versatility of the hybrid dual-fuel engine gives it a distinct advantage over standard gas powered generators. It has low noise levels, outstanding safety features and is easy to use. All of this makes the DuroMax XP12000EH one of the best portable generators on the market.